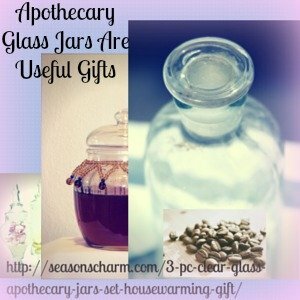 The 3 Pc Clear Glass Apothecary Jars Set Housewarming Gift is a useful gift. You can use these as clear glass candy or cookie jars to store your biscuits, candy, sweet treats, spices etc. The 3 apothecary glass jars come with different sizes and unique designs. Beautiful and useful, apothecary glass jars have multiple uses around the house. 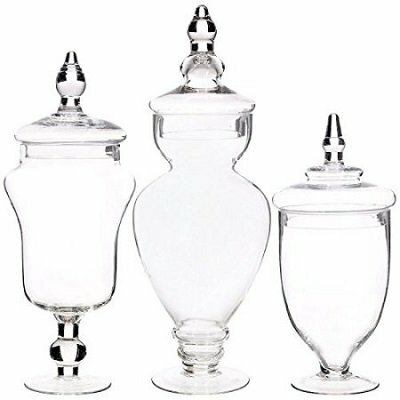 Elegantly designed and made with hand blown clear glass, this beautiful set of 3 pieces clear glass apothecary jars with lids can also be used as decorative jars on the coffee table or mantle. You can fill them with dried flowers, beautiful small stones etc. When used in the bathroom to hold cotton balls, Epsom salt, bath salts etc., the glass jars add a decorative appeal to the bathroom decor. This lovely 3 Pc Clear Glass Apothecary Jars Set Housewarming Gift has multiple uses and would be well received.